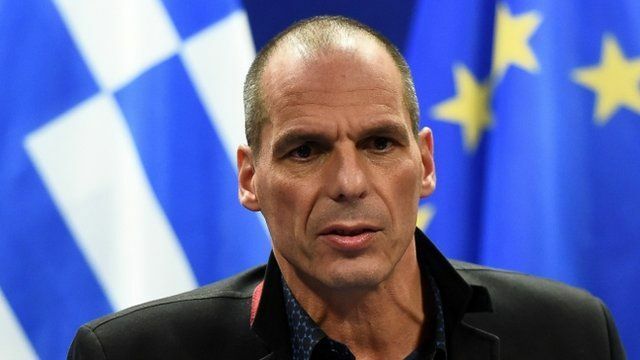 Greece will do 'whatever it takes' Jump to media player Greece's finance minister Yanis Varoufakis says he is ready to do "whatever it takes" to reach agreement on its bailout in the next two days. The Grexit explained - in 60 seconds Jump to media player Could Greece's debt problems force it out of the eurozone? BBC News takes a snapshot view of the debt crisis. Greek people 'not afraid anymore' Jump to media player The BBC's Mark Lowen speaks to people in an Athens fish market, as Greece's new Prime Minister Alexis Tsipras tries to renegotiate a bailout at his first EU summit. Varoufakis: Debt talks 'constructive' Jump to media player Talks between the new Greek government and eurozone representatives on the future of Greece's debt repayments are "very constructive", the country's finance minister says. Huge crowd gathers at Athens rally Jump to media player Greece's anti-austerity government is presenting its first concrete proposals for an alternative debt plan at an emergency meeting of eurozone finance ministers in Brussels. What does Greece want from EU talks? Jump to media player Chris Morris looks at the challenge facing Greece's Prime Minister Alexis Tsipras and EU officials in their talks. Greece's finance minister Yanis Varoufakis says he is ready to do "whatever it takes" to reach agreement on its bailout in the next two days. Mr Varoufakis was speaking after talks with EU finance ministers broke down earlier than expected, with Greece describing the EU's offer as "absurd". Greece wants the conditions of its €240bn (£178bn) bailout restructured.